Path to Publishing is a new blog series in which I interview published authors. It’s a great way for them to get free exposure as well as help other writers who are trying to get published. 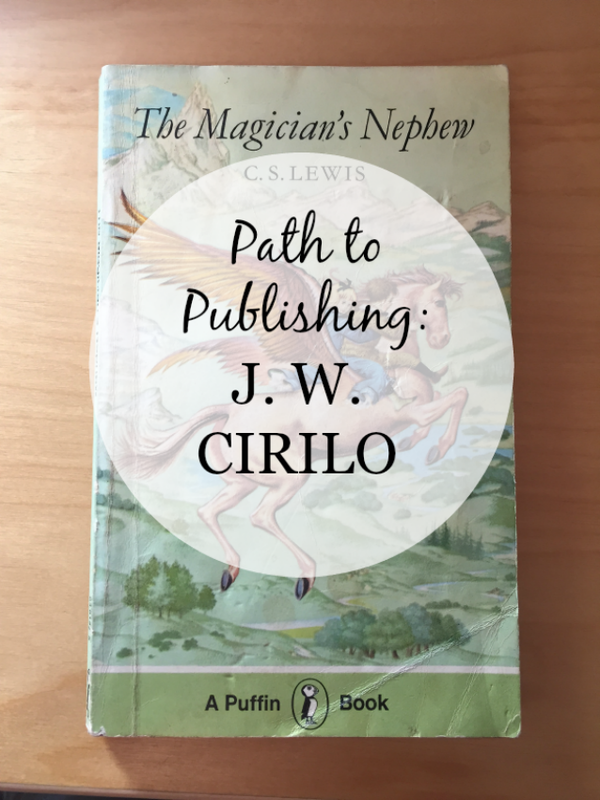 This week, I’m featuring new adult fiction writer J. W. Cirilo. My name is J.W. Cirilo and I write primarily New Adult Fiction, particularly what I like to refer to as folk fiction. That’s actually a difficult question to answer for me. I don’t actually remember a time in my life when I wasn’t a writer. From a very early age I’d been scribbling song lyrics and poetry in crayon (albeit not very good ones). All the encouragement and praise I got growing up fostered the need to attach myself to my writing. Another very difficult question. I grew up with the Harry Potter series and Lemon Snicket’s masterpiece, “A Series Of Unfortunate Events,” so I’d have to say those two series, both I’ve left unfinished because, much like Matt Smith, I hate endings! I’ve read a lot on the in-between, and there are so many influential books that have no doubt inspired and helped realize my genre and shape me into the writer I am and the writing I do, but really what shaped my writing primarily was music, not so much books. That’s probably blasphemous, what I just said, in terms of the literary world. “The Magician’s Nephew” by C.S. Lewis. I’m kind of a kid at heart, I guess. There’s just something so inspired about his world, and it’s one of the very few titles in my library I find myself coming back to repeatedly every five or so years. Self-publishing writers, in my feeling, very often jump the gun on what they’re doing. With traditional publishing, you have gate keepers, editors, artists- whole teams of people working on making your art both marketable and personal. Self-publishing is as easy as click and post these days, especially with KDPS and Ingram, but if a self-publisher invested the time and money into meticulously crafting their book, I think that’s more personal and intimate. If working in journalism has taught me anything it’s that writing is a lot more about having your voice heard and your work appreciated than making money. There’s probably a huge list of artistic powerhouses not limited to the great Neil Gaiman that one could cite as traditional publishers who have remained creatively true to their craft, but I would argue even he would agree, if your wish is just to be read and not try to make a semi-stable career out of this, self-publishing probably isn’t the worst road (assuming you take it seriously). Both are incredibly difficult endeavors to partake in, so it’s really just a preferential thing; do you want to work with a company, or have the burden of the lot left on your shoulders? My writing routine has barely anything to do with a routine, or writing for that matter. A lot of it is spent pacing around my apartment with a tennis ball arguing with myself over direction, pacing and scenes that I’m not fully comfortable with yet. Eventually something strikes me like a diamond bullet and that’s when I sit down to begin punching away at the keyboard for eight hours or more. Once I’ve started, it’s nearly impossible for me to stop. That is, unless I run out of idea or wrote something especially “brilliant’ that I just can’t top. At that point, I have to stop and come back later or the next day because everything after a great line just looks like filler. I need that refreshing celebration for a time, and if it means I only got a few hundred words done, that’s fine. I’m in no rush for deadlines right now, and hopefully my readers will appreciate that patience when the finished project falls on their lap. Funny enough, I went to school with the CEO of the company that would hire me as an editor for their quarterly magazine. It was a bit of serendipity, I suppose. We worked at the school paper together for a few months and then he asked me out of the blue to come write for them. One thing lead to another, I pitched my novel, and book deal! Not very exciting, I know, and sometimes I consider that Vonnegut queried over a hundred agents before he got a deal, and Rowling’s agent spent years pitching her first book to publishers, so I feel like I benefited from a privilege that almost makes me undeserving of a break. At those times I try to tell myself that I earned it because I was a good writer, not because the guy solely was doing me a favor, and that sometimes helps. Keep true. If this is what you really want, that makes you feel like you matter and what you do matters, keep true to the path your on. Don’t give up because the world can be discouraging, and don’t stop because you’ve hit a wall with rejections. We often look at the victories and successes of our heroes because they made it to the top of the mountain, but so often lost in translation is the story of their struggling climb upward. Once they were just like us, and we have to believe we to can get there too, maybe not to the same effect or level of success, but we can get there. The pride that must be yours to look upon your finished work must be something to look forward to- to stoke those fires of motivation. Keep climbing. I’m still very new to this, so I’m not really sure I can give any insight about that. One thing I was surprised of was how much more complicated it was than I thought. There’s a lot of PR and marketing and meet and greets, as well as all the little details to work out. It’s not just here’s the book, six months later, it’s published. Incredibly, for me anyway, it’s a bit more complicated than that. As of right now, my debut novel has not been released because of the aforementioned complications, but when there’s news to be announced and all the fun stuff, you can find me on Twitter, which, for now, is the best place to get in touch with/follow for updates.